In Orvieto there are lots of things to see; a beautiful cathedral, museums, quaint little streets and squares, a funicula! There are also a million other tourists wanting to see all these lovely things. On at least one of my visits, I managed to avoid the large tourist groups but even I couldn’t evade the school outing group of screeching teenagers. It was ok though. They did what all school outing groups of screeching teenagers do: charge about screeching for 15 minutes and then go for lunch. And, to be fair, it is actually their own local history that we were looking at so if anyone has more right to be there, it’s them. Anyway, the kids in no way spoiled my enjoyment of the site and even gave me a thinking point or two. 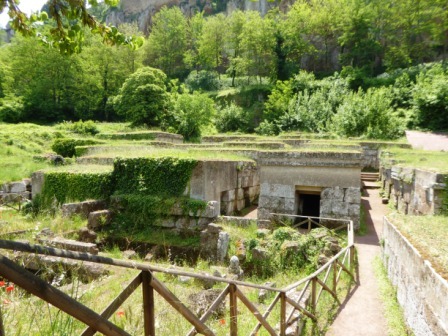 The site in question was a rather fancy Etruscan necropolis, Necropoli Etrusca di Crocifisso del tufo, which is just on the northern slope of the rock of Orvieto. 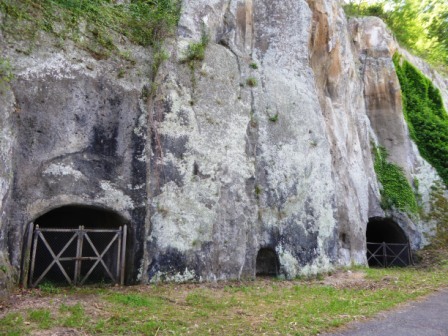 The area around the rock of Orvieto contains numerous rock-cut tombs, the final resting places of the ancient (roughly mid-6th – late-5th century BCE) people of Velzna, the Etruscan city on this site. The particular necropolis that I’d come to see, however, consisted of neat rows of little house-tombs, built close together and kitted out with suitable resting places for the deceased. 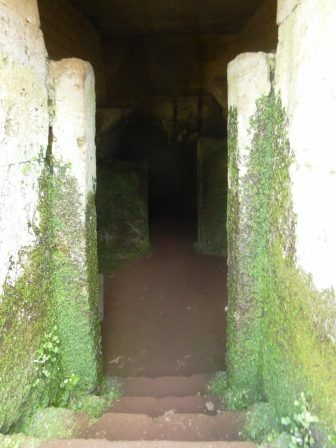 The tombs are pretty uniform, with only minor variations, which has lead to hypotheses about Etruscan equality and a relative lack of hierarchy in Etruscan society in this area. There is certainly none of the conspicuously competitive display of Roman tombs, just a neat, rather middle-class conformity. You wouldn’t believe it from these photos but I was dodging excited teens the whole time. Anyway, I took my time, because these tombs have some very interesting construction features that I wanted to have a look at. On a hot hot Italian day, it was deliciously cool inside the tombs. 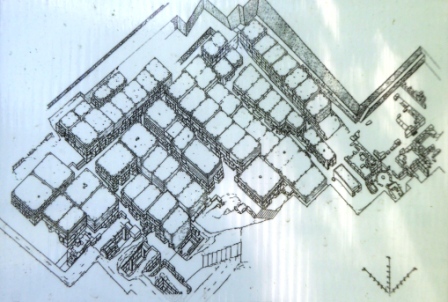 You can see that they’re not underground, although the ground surface on which they were built is several feet lower than the modern ground level. Still, just stepping down the foot or two from the excavated ground level into the tombs, the temperature drops really noticeably. Inside the tomb you can see pretty clearly how it’s made. The walls are built up with tufa blocks, using no mortar, and then the roof is built by setting blocks lengthways, projecting progressively inwards. These are then locked in place using t-shaped keystones along the roof spine. You’ll notice that from the outside, the roofs are flat. This shaped roof is a ‘pseudo roof’ on the inside of the tombs. The remaining tomb furniture consists of benches for the bodies. The deceased were interred with a range of tomb goods which have since been removed. These consisted of Greek pottery vases, in both red- and black-figure; bronze and iron objects; weapons; jewellery and personal items. Some are on display at the on-site museum. Back outside, above or beside the doorway, the names of the inhabitants are inscribed. 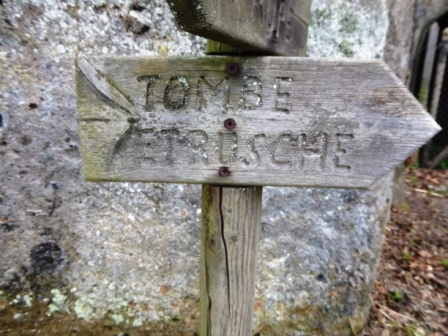 I can’t read Etruscan but I am reliably informed that the range of names seen on tombs in this area indicates high levels of immigration. Many new Orvietans were foreigners. Seeing these names inscribed on the tombs while dodging screeching teenagers caused me to think about who the people interred in the tombs actually were, and how, or if, the screeching teenagers were connected to them by more than just geography. 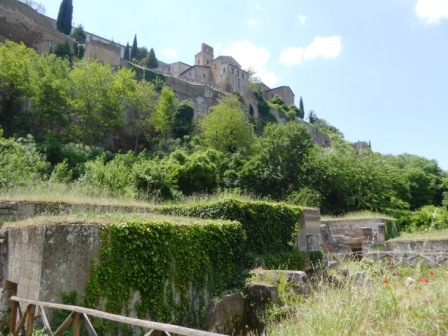 I wondered if any of the modern people of Orvieto can, even tenuously, claim descent from the more ancient people of this area. I suspect that it’s impossible to know. The random comings and goings of peoples, immigration, emigration, conflicts, invasions and exodus all change who the ‘locals’ are, and over the course of twenty-six centuries, the ‘locals’ are apt to change a lot. Still, those screeching teens and these silent Etruscans do have one thing in common; the rock of Orvieto.